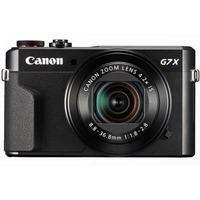 The Canon PowerShot G7 X II brings expert-level control and uncompromising image quality into a classically styled compact small enough to take anywhere. With a 1.0-type sensor, bright f/1.8-2.8 lens and superior DIGIC 7 processing engine, this pocket-sized, large-sensor compact offers DSLR-like creativity when capturing both stills and Full HD video. The camera's 5-axis Advanced Dynamic IS and MF Peaking will ensure pin-sharp focus and steadycam-like footage, while the 3.0" vari-angle LCD with Touch AF permits low-angle shooting and quick fingertip control for cinematic focus pulls. Canon PowerShot G7 X Mark II Digital Camera, Great Condition. MINT Canon PowerShot G7 X Mark II 20.1 MP Digital Camera - Black - Used ONCE.